Our first full episode, recorded today (28 May 2010). “Horrible Lotus Notes” tweets, the every-increasing success of Lotus User Groups, that Apple tablet-thing, the end of Notes/Domino6.5, does Lotus really Know, and more. Mike Smith, Tim Clark and Handly Cameron. This podcast is 67MB and runs for 70 minutes at 128kps. Enjoy! 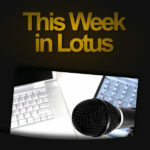 A short introduction to our new podcast, This Week in Lotus. This podcast is 2.3MB and runs for 2.5 minutes at 128kps. Enjoy!